A while back I was lucky enough to have fortune on my side and I got a set of brand new mud tyres to test out on my 1998 Land Rover Discovery 3,9i V8. General Tire was the kind sponsor and they gave me a set of General Grabber MT 265/75 R16. Now, for a weekend warrior that would be a nice to have gift, but along with Team Offroad, I do a lot of training in the off-road sector, on varying terrain. I bought the vehicle with another set of a certain American brand (I will not name them) and was satisfied, but not impressed or blown away. They were All-Terrains, but for my application they should work fine, and they honestly did. Except when it came to sand driving. To get adequate traction in sand, you need to deflate your tyres. When the tyre has a very stiff sidewall, you need to deflate them more. But the more you deflate them, the better your chances are off a tyre de-beading in corners or when turning. This happened to me a number of times with these tyres. If I deflated them to below 0.8 bar, the left rear tyre would de-bead, leaving me with a time consuming bush fix on my hands, when I could be spending that time burning petrol in my V8. I thought it might be a question of the specific tyre having a flaw, so I rotated the rear wheels, and still had the same issue. In the end I concluded that the inertia of the vehicle going around corners, with a lot of weight on the rear wheels in the form of the fuel tank and a fridge, it would pop the tyre off the rim. I thought it could be something to do with my driving style, and started being more cautious and reserved when driving on sand. On rocks and other terrain, the tyres performed well enough. This all changed when I fitted the Generals. On rocks and gravel they stick like glue and when it comes to sand, I was in for a whole new world of fun. Some people believe that smooth, almost slick like tyres are best for sand driving, but I think that these Generals are best for sand driving. I can deflate them to well below 0.8 bar and I have not had a single issue with a de-bead or any other deflation problems. I deflate them, go play all day, and don’t even have to worry about them holding me back. 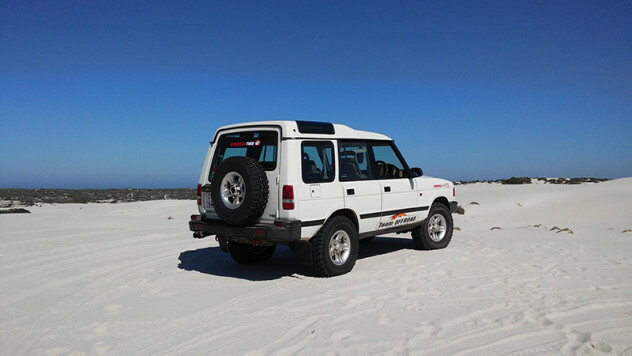 In fact, the performance of these tyres on sand has made me conquer dunes and obstacles that were not possible on the other tyres, simply because I can deflate them more to increase the footprint and give me better traction. On tar road they are noisy as any mud terrain tyre is, but their grip in the wet is notable, as well as the way the Disco feels stuck to the road in corners. They have been on the Disco now for a couple of months, and no signs of wearing down is visible. Which indicates that tyre life will not be too big an issue. But to be fair, I do not drive the vehicle every day, and when I do, it is mostly only to reach an off-road destination. Would I fit these tyres to my vehicle again? You bet I will.